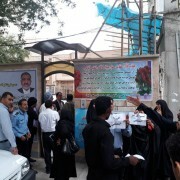 The 500 citizens were arrested and detained following their participation in anti -racism/discrimination demonstration against Islamic Republic of Iran Broadcasting. 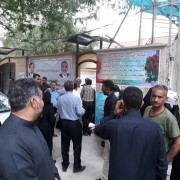 Similatiously other family members gathered in front of the offices of Ahwaz representatives in Iranian Majles (parliament), Mr Ali Sạri and jawad Al-bạji . 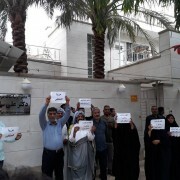 According to Ahwaz Human Rights Organization (AHRO)’s sources families will continue their manifestations in front of the revolutionary court and security offices and agencies and other MP’s offices in coming days until the fate and whereabouts of their children ,wives, sons and daughters are disclosed. 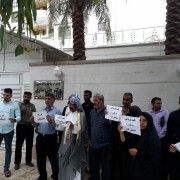 The families of detained Ahwazi Arab citizens have also signed a joint statement that discloses that there are dozens of women and teenagers under 18 years, among the detainees. 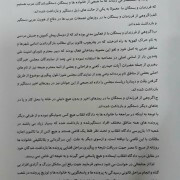 In this joint statement they have called on governor of Khuzestan to take action as they have been following up the news of their family on daily basis with no avail. And unfortunately non of the responsible institutions such as branch 12 of Ahwaz revolutionary court have replied to their enquirers and there was no possibility to contact the judge who is repressible for their cases. The statement urges the Iranian authorities to release the detainees because they believe their children, wives and husbands as Ahwazi Arabs have rightfully participated in the peaceful demonstrations to defend their ethnic identity against the hate speech and racism of Iranian national TV. They also added that these young activists were asked for civil rights under constitution but they were arrested for no reason at home, their workplace and even in the street. 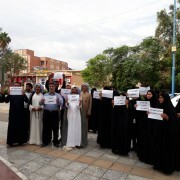 It is worth mentioning that the protests of the Arab people of Iran started in response to channel 2 program on national TV which denied Ahwazi Arab existence on Iran’s map .However it continued to reach protest against other form of racism and discrimination against Arabs in Iran such as Islamic Republic of Iran policies of demographic change, forced immigration of Arabs from their land by cutting water on farmers, and bringing emigrant workers from other provinces on the expense of unemployment of indigenous Arabs. Other demands of the Arab people are the right of education in their native language, unpaid wages , the transfer of water from Karoon tiver that is on the verge of disappearance, the erosion of the process of environmental degradation, arbitrary arrests , lack of freedom of press and independent media in Arabic. 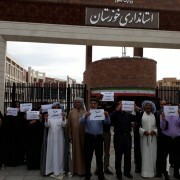 Ahwaz Human Rights Organization is deeply concerned with the well-being of the detainees and emphasises the right of the Ahwazi Arab people to continue peaceful demonstrations, and calls for an end to the crackdown of these legal gatherings and the immediate and unconditional release of all detainees.